The most important aspect of this project is the technique used when sanding the floor.� If you aren't careful while sanding, you can seriously damage the floor.� You have to keep the sander moving at an even speed with constant attention to what is happening. 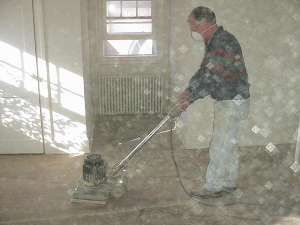 This first step is to asses your floors and determine how much sanding is necessary.� There are two levels of floor refinishing:� The first is where the finish is damaged but the wood beneath is in good condition.� The second is where the finish and the wood are damaged.� The objective for both is the same: removing the damaged material while preserving as much of the wood flooring as possible.� Floors can only be sanded but so many times before they have to be replaced. Dust respirator and eye protection is a must! Be careful with power sander - do not run over power cord.